In the last few years, scientists have developed biological micromotors for delivering drugs. They’re supposed to work like propellers, steering those healing medicinal molecules more quickly into your bloodstream. But there’s a problem. These motors are fueled by stomach acid, with a strict one-time use policy. Given their short life expectancy, micromotors must not fuel-up BEFORE entering the stomach. But it can be tricky avoiding acid on the journey through your esophagus! That’s where UC San Diego nanoengineers Emil Karshalev and Joseph Wang come in. They designed a protective transport vehicle in the form of a sugar pill. These pills were loaded with thousands of micromotors. 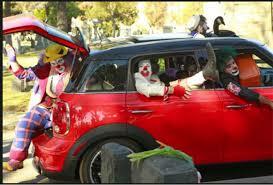 Picture one of those circus clown cars, jam-packed with Bozos! To test this delivery method they fed some micromotor pills to lab mice. Results? WAY more micromotors reached the stomach lining when encased in the pills! Such micromotor pills could increase the amount of medication entering your system. That means you’ll feel better without having to pop extra medicine. And all those teeny tiny clowns in your stomach couldn’t hurt! Never mind the big shoes.